This is my recipe swap challenge for the month of April. This Month my partner was Veena who blogs at veenasvegnation.com. Looking through Venna’s blog was really interesting. She has a lot of really exciting recipes, some with ingredients that were new to me. I book marked a fair few of them and hope to cook my way through them. For the challenge though, I chose her Carrot and Zucchini noodles recipe. It’s a simple recipe but I love both the ingredients and it is a perfect salad idea for our lunch boxes. 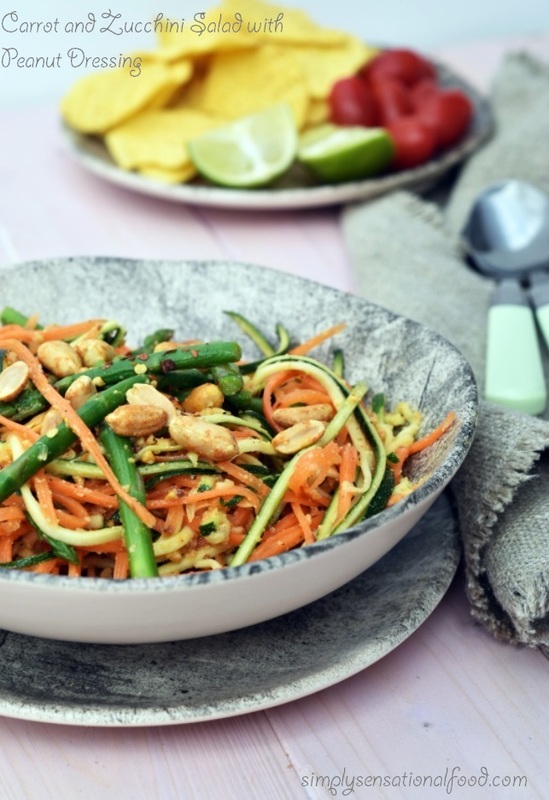 As a family we are also on a healthy eating programme so it made sense to make this recipe. I did make a few minor changes to the recipes. I could not get black carrots so I used some asparagus together with the orange carrots and zucchini. The flavours in Veenas salad were simple so I pepped up my version by adding added a few more ingredients to the dressing to give the salad a little spicy kick. 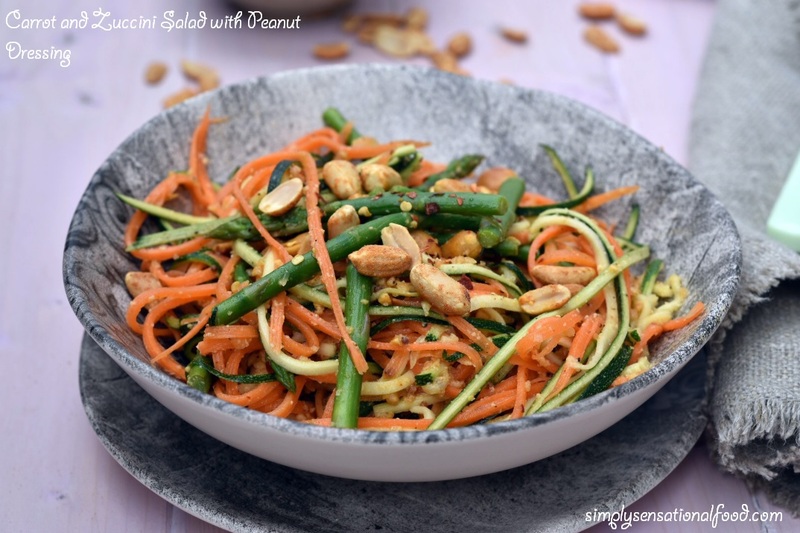 Spiralised Carrots and Zuccini with a tangy spicy peanut dressing. In a pan add some water and when it comes to boil add the asparagus and boil for three minutes after which remove the asparagus with a slotted spoon and place in iced water to stop cooking. Drain and add to a large bowl. To the Asparagus add the spiralised carrot and zucchini. Coarsely grind 30 g of peanuts and add to the salad. Add all the ingredients for the dressing in a jar with a lid and shake to emulsify. Pour the dressing over the salad and toss. 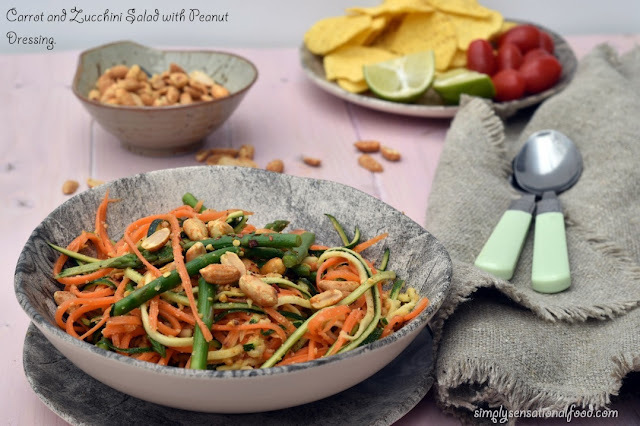 Transfer the salad to a serving bowl and garnish with remaining whole peanuts and sesame seeds. If you enjoy visiting simplyfood and have not signed up would like to receive regular updates and a monthly newsletter straight into your inbox please sign up by email. You will find the email signup right at the top under my photo in the side bar.